Objective: This study aimed to assess the diagnostic value of ischemic penumbra (IP) selection using fusion images of Perfusion-Weighted Imaging (PWI) and Diffusion-Weighted Imaging (DWI), compared with volumetric-based Perfusion-Diffusion Mismatch (PDM) in patients with Acute Ischemic Stroke (AIS). Materials and Methods: A total of 42 patients with a confirmed diagnosis of AIS were included in this retrospective study. DWI images were overlaid onto PWI images to obtain fused images using 3D fusion software. Two experienced neuroradiologists estimated the qualitative PDM using fused and paired images, respectively. The results were comparable to the results of volumetric-based PDM, which were obtained using semi-automated quantitative software. Results: The time consumed for qualitative measurement was significantly different among different assessment methods, but no significant differences were found in time consumed for qualitative PDM assessment using fused and paired images. The qualitative PDM was significantly lower than quantitative PDM. The two qualitative PDM subgroups related to quantitative PDM had a sensitivity of 84.21% and 77.78%, specificity of 78.26% and 60.86%, positive predictive rate of 94.12% and 87.50%, and negative predictive rate of 90.00% and 82.35%, respectively. A high consistency in qualitative PDM assessment using fused images (Kappa=0.762) but a low consistency in qualitative PDM assessment using paired images between two observers were observed (Kappa=0.561). Conclusions: The fusion images of DWI and PWI provided information comparable to the information provided by volumetric-based PDM. It took less time and hence might be an effective approach for IP selection in patients with AIS. Rapid and valid assessment of Ischemic Penumbra (IP) is the key process to obtain a favourable treatment outcome for patients with Acute Ischemic Stroke (AIS). Majority of stroke centers calculated ischemic volumes of perfusion and diffusion for IP selection even though in acute situations [1-3]. Only few stroke centers used qualitative mismatch to select patients for clinical treatment decisions . However, the volumetric-based Perfusion-Diffusion Mismatch (PDM) is not practical in IP selection in clinical scenario. Rapid assessment of PDM seems to be more suitable for the emergency requirements in patients with AIS’s. It helps neuroradiologists and neurologists in rapid diagnosis and treatment planning. In recent years, more attention has been paid to multimodal medical image fusion owing to its increasing demand in clinical diagnosis and treatment of many diseases, such as surgery and image-guided radiotherapy . Fused images can supply complementary information to make a more accurate and rapid diagnosis [6,7]. This study hypothesized that using fusion images of Perfusion-Weighted Imaging (PWI) and Diffusion-Weighted Imaging (DWI) can be a rapid and accurate method for qualitative PDM assessment in patients with AIS for IP selection. This method was compared with the volumetric-based PDM, which was used as the “gold standard.” Volumetric-based PDM is defined as a ratio of perfusion-diffusion lesion volume>1.2, which reflects the presence of clinical mismatch significantly [8-11]. We retrospectively retrieved data of 144 patients treated at our hospital with AIS from January 2013 and April 2015. Inclusion criteria were as follows: (1) Time from symptom onset to Magnetic Resonance Imaging (MRI) scan was less than 24 h, including PWI, DWI, T1-weighted (T1WI), and T2-weighted (T2WI) sequences; (2) Clinical symptoms such as hemiplegia or hemiparesis, with or without speech disorder; (3) Acute infarct in the territory of middle cerebral artery, which appeared hyperintense in DWI (b=1000 mm/s2) and hypointense in apparent diffusion coefficient map. Exclusion criteria were as follows: (1) Patients received thrombolysis or anticoagulant therapy before magnetic resonance imaging (MRI) scan; (2) Symptom onset time was not clear. A total of 42 patients (25 males and 17 females) were enrolled in this study with the age range 38-84 y, median age 71 y, and average age 72.3 y. The clinical study protocol was ethically reviewed and approved by the Institutional Review Board of the Second Affiliated Hospital of Nantong University. 1. DWI: Echo planar imaging spin echo; time to repeat (TR): 6600 ms; time to echo (TE): 100 ms; slice thickness: 5 mm; matrix size: 192 × 192; Field of View (FOV): 230 × 100 mm2; b values 0 and 1000 s/mm2; flip angle: 90°. 2. T1WI: TR: 2000 ms; TE: 9 ms; slice thickness: 5 mm; matrix size: 320 × 240; FOV: 230 × 98.8 mm2; flip angle: 150°; acquisition time: 1:24 min. 3. T2WI: TR: 5500 ms; TE: 95 ms; slice thickness: 5 mm; matrix size: 384 × 288; FOV: 220 × 100 mm2; flip angle: 150°; acquisition time: 1:10 min. 4. PWI: TR: 1500 ms; TE: 30 ms; slice thickness: 4 mm; matrix size: 128 × 128; FOV: 200 × 100 mm2; flip angle: 90°; 60 dynamic scans (0.1 mmol/kg Gd-DTPA (Gadolinium-diethylenetriamine penta-acetic acid) 4 ml/s using a power injector, injection after the fourth frame), resulting in an acquisition time of 1:38 min. Relative Cerebral Blood Volume (rCBV), relative Cerebral Blood Flow (rCBF), Time to Peak (TTP), and Mean Transit Time (MTT) maps were derived using perfusion software. DWI images were overlaid onto MTT maps from PWI to obtain a single PWI/DWI fusion image using 3D fusion software of a commercially available workstation (Syngo MR Workplace) and then different pseudo-colors were added. All images were evaluated using our Picture Archiving and Communication System (PACS). 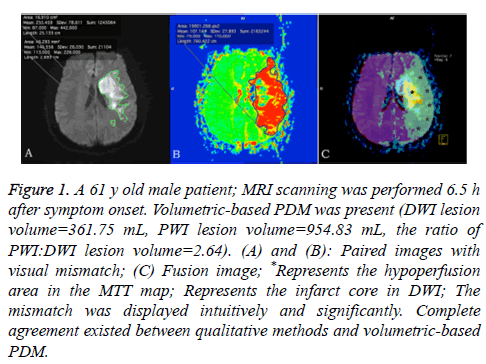 Volumetric-based PDM (Quantitative PDM):PWI and DWI images were analyzed by experienced neuroradiologists. The MTT map from PWI was selected for this study. It was considered to be more sensitive to ischemia in patients with AIS . The experienced neuroradiologist measured and calculated the ischemic lesion volumes in MTT maps and DWI series using semi-automated quantitative software. First, the ischemic lesion areas were segmented slice by slice using a manual outline on MTT and DWI images. The hyperintense areas in DWI and the MTT prolonged areas were considered to be hypoperfusion regions. Excluding the artefacts, the areas in every slice were recorded. Second, the ischemic volume was calculated by multiplying all lesion areas by the slice thickness [13,14]. When the ratio of perfusion-diffusion lesion volume was >1.2, the patient was considered to have IP. The time consumed in volumetric-based PDM assessment for every patient was documented in all the aforementioned processes. Visual PDM (qualitative PDM): Qualitative PDM assessment was divided into two subgroups according to images of different patterns. Pattern I was PWI and DWI fusion images (visual pattern I), and pattern II was paired images of PWI and DWI (visual pattern II). All the images were evaluated by two experienced neuroradiologists (more than 10 y experiences in imaging diagnostics) independently, who were blinded to the clinical information and calculated outcomes. The time consumed in qualitative PDM assessment for each neuroradiologist was documented. SPSS (version 19.0; SPSS, IL, USA) was used for statistical analysis. The results were expressed as mean and standard deviation of time consumed. The chi-square test was used to analyze the agreement between the two observers in qualitative PDM assessment. Analysis of variance was used to assess any difference in time consumed for PDM assessment among the different assessment methods. The least significant difference method was used to assess the difference among methods. A P value less than 0.05 was considered statistically significant. A total of 42 patients were analyzed in this study. The time interval between symptom onset and MRI scan was less than 24 h. 19 patients were considered to have volumetric-based PDM because the perfusion-diffusion lesion volume ratio was up to 1.2 in these patients (Figure 1). Figure 1: A 61 y old male patient; MRI scanning was performed 6.5 h after symptom onset. Volumetric-based PDM was present (DWI lesion volume=361.75 mL, PWI lesion volume=954.83 mL, the ratio of PWI:DWI lesion volume=2.64). (A) and (B): Paired images with visual mismatch; (C) Fusion image; *Represents the hypoperfusion area in the MTT map; Represents the infarct core in DWI; The mismatch was displayed intuitively and significantly. Complete agreement existed between qualitative methods and volumetric-based PDM. The time consumed for qualitative measurement was 503.74 ± 332.75 s. The average time consumed for the two subgroups of quantitative measurement between the two observers was 92.92 ± 8.24 s and 92.77 ± 9.43 s, respectively. Significant differences were found among the three assessment methods (F=63.95, P<0.001), but no significant differences were noted in time consumed for qualitative PDM assessment using fused and paired images (P=0.997, P>0.05). The qualitative PDM was significantly lower than the quantitative PDM (P<0.01). The two qualitative PDM subgroups related to quantitative PDM had a sensitivity of 84.21% and 77.78%, specificity of 78.26% and 60.86%, positive predictive rate of % 94.12% and 87.50%, and negative predictive rate of 90.00% and 82.35%, respectively (Table 1). A high consistency in qualitative PDM assessment using fused images (Kappa=0.762), but a low consistency in qualitative PDM assessment using paired images, between two observers were noted (Kappa=0.561) (Table 2). Pattern I: Qualitative PDM was determined using PWI/DWI fusion images; Pattern II: Qualitative PDM was determined using paired images. IP: Ischemic Penumbra; PDM: Perfusion-Diffusion Mismatch; PPV: Positive Predictive Value; NPV: Negative Predictive Value. Table 1: Diagnostic value of the qualitative PDM in IP selection compared with the volumetric-based PDM. Pattern I: Qualitative PDM was determined using PWI/DWI fusion images; Pattern II: Qualitative PDM was determined using paired images. PDM: Perfusion-Diffusion Mismatch. Table 2: Inter-observer agreement in different patterns of qualitative PDM. The present study showed that the visual PDM through fused images was a signature of ischemic penumbra in patients with AIS. The visual PDM on fused images had a high consistency between the two observers compared with paired images. Some studies have investigated the visual PDM used for IP selection. Campbell et al. reported that the visual assessment of PDM had a lower inter-rater reliability . It was not accurate enough for clinical decisions. The reason might be that the observers reduced the visual bias when they used the fused images in PDM assessment because single-modality medical images had their own scope and some limitations. The visual PDM could supply sufficient information for diagnosis or treatment. In this study, the MTT maps were used for assessment. MTT is a very good assessment tool for ischemic brain tissues . Several studies have demonstrated the association between prolonged MTT and elevated oxygen extraction fraction [12,15]. The fusion images of MTT and DWI could reflect not only the ischemic lesions in DWI images, but also the hypoperfusion lesions in PWI images. These images reflected the qualitative PDM intuitively. They improved the diagnostic consistency compared with paired images for qualitative assessment. This study also showed that the visual assessment of PDM was rapid; the evaluation time shortened significantly. Complex calculations were avoided because the fused images supplied intuitive images for IP selection. This was very important for patients with AIS. Previous studies showed that the real-time monitoring of PDM was useful in PDM assessment. It might be beneficial for rescuing more patients with ischemic stroke [16-20]. Moreover, the fusion technology is simple to implement, which may help inexperienced radiologists to make accurate judgments. This study had certain limitations. First, it compared only the qualitative PDM assessment approach to volumetric-based PDM. The clinical outcomes when the qualitative PDM was used as a treatment target for thrombolysis were not explored. Prospective studies should aim to validate the effect in clinical scenario. Second, only the MTT maps from PWI were selected for image fusion in this study. They could not represent all PWI parameters. What roles the rCBV, rCBF, and TTP maps would play in fused images for PDM assessment requires further investigation. Third, the volumetric-based PDM was calculated using the semi-automated quantitative software. The manually drawn regions of interest may be without a stringent threshold. The automated quantitative software may improve the measurement accuracy in the future. Finally, this study was a retrospective observational study. The selection bias from the review approach could not be ruled out, and the sample size was small. A larger-sample study may be performed in the future to confirm the value of fused images in clinical applications in patients with AIS. The fusion image of PWI and DWI was a new technology used in patients with AIS. It was a simple method for IP selection and had a high diagnostic efficacy compared with volumetricbased PDM. It improved the inter-observer consistency and consumed less time. Fusion images could be a rapid, intuitive, and useful approach for IP selection in patients with AIS. The fused images may be used in qualitative PDM assessment for IP selection. This work was supported by the grant of Science Foundation of Nantong (YYZ16015). Wahlgren N, Ahmed N, Davalos A, Hacke W, Millan M, Muir K, Roine RO, Toni D, Lees KR. Thrombolysis with alteplase 3-4.5 h after acute ischaemic stroke (SITS-ISTR): An observational study. Lancet 2008; 372: 1303-1309. Hacke W, Kaste M, Bluhmki E, Brozman M, Dávalos A, Guidetti D, Larrue V, Lees KR, Medeghri Z, Machnig T, Schneider D, von Kummer R, Wahlgren N, Toni D. Thrombolysis with alteplase 3 to 4.5 hours after acute ischemic stroke. N Engl J Med 2008; 359: 1317-1329. Hacke W, Albers G, Al-Rawi Y, Bogousslavsky J, Davalos A, Eliasziw M, Fischer M, Furlan A, Kaste M, Lees KR, Soehngen M, Warach S. The Desmoteplase in Acute Ischemic StrokeTrial (DIAS): a phase II MRI-based 9-hour window acutestroke thrombolysis trial with intravenous desmoteplase. Stroke 2005; 36: 66-73. Ribo M, Molina CA, Rovira A, Quintana M, Delgado P, Montaner J, Grivé E, Arenillas JF, Alvarez-Sabín J. Safety and efficacy of intravenous tissue plasminogen activator stroke treatment in the 3- to 6-hour window using multimodal transcranial Doppler/MRI selection protocol. Stroke 2005; 36: 602-606. Maxeiner A, Fischer T, Stephan C, Cash H, Slowinski T, Kilic E, Durmus T. Real-time MRI/US fusion-guided biopsy improves detection rates of prostate cancer in pre-biopsied patients. Aktuelle Urol 2014; 45: 197-203. ZhuYM, Cochoff SM. An object-oriented frame work for medical image registration, fusion, and visualization. Computer Methods Programs Biomed 2006; 82: 258-267. Duan C, Wang X, Wang H, Wang S. Magnetic resonance image fusion based on three dimensional band limited shearlet transform. Sheng Wu Yi Xue Gong Cheng Xue Za Zhi 2015; 32: 181-186. Nagakane Y, Christensen S, Brekenfeld C, Ma H, Churilov L, Parsons MW, Levi CR, Butcher KS, Peeters A, Barber PA, Bladin CF, De Silva DA, Fink J,Kimber TE, Schultz DW, Muir KW, Tress BM, Desmond PM, Davis SM and Donnan GA. EPITHET: Positive result after reanalysis using baseline diffusion-weighted imaging/perfusion-weighted imaging co-registration. Stroke 2011; 42: 59-64. Davis SM, Donnan GA, Parsons MW, Levi C, Butcher KS, Peeters A, Barber PA, Bladin C, De Silva DA, Byrnes G, Chalk JB, Fink JN, Kimber TE, Schultz D,Hand PJ, Frayne J, Hankey G, Muir K, Gerraty R, Tress BM, Desmond PM. Effects of alteplase beyond 3 h after stroke in the Echo Planar Imaging Thrombolytic Evaluation Trial (EPITHET): a placebo-controlled randomised trial. Lancet Neurol 2008; 7: 299-309. Fiebach JB, Hopt A, Vucic T, Brunecker P, Nolte CH, Doege C, Villringer K, Jungehulsing GJ, Kunze C, Wegener S and Villringer A. Inverse mismatch and lesion growth in small subcortical ischaemic stroke. Eur Radiol 2010; 20: 2983-2989. Sims JR, Gharai LR, Schaefer PW, Vangel M, Rosenthal ES, Lev MH, Schwamm LH. ABC/2 for rapid clinical estimate of infarct, perfusion, and mismatch volumes. Neurol 2009; 72: 2104-2110. Kamath A, Smith WS, Powers WJ, Cianfoni A, Chien JD, Videen T, Lawton MT, Finley B, Dillon WP and Wintermark M. Perfusion CT compared to H2 (15)O/O (15)O PET in patients with chronic cervical carotid artery occlusion. Neuroradiol 2008; 50: 745-751. Campbell BC, Christensen S, Foster SJ, Desmond PM, Parsons MW, Butcher KS, Barber PA, Levi CR, Bladin CF, Donnan GA, Davis SM. Visual assessment of perfusion-diffusion mismatch is inadequate to select patients for thrombolysis. Cerebrovasc Dis 2010; 29: 592-596. Ueda T, Yuh WT, Maley JE, Crosby DL, Zhu MW, Magnotta VA. Outcome of acute ischemic lesions evaluated by diffusion and perfusion MR imaging. AJNR Am J Neuroradiol 1999; 20: 983-989. Yata K, Suzuki A, Hatazawa J, Shimosegawa E, Nagata K, Sato M, Moroi J. Relationship between cerebral circulatory reserve and oxygen extraction fraction in patients with major cerebral artery occlusive disease: A positron emission tomography study. Stroke 2006; 37: 534-536. Copen WA, Rezai Gharai L, Barak ER, Schwamm LH, Wu O, Kamalian S, Gonzalez RG, Schaefer PW. Existence of the diffusion-perfusion mismatch within 24 hours after onset of acute stroke: dependence on proximal arterial occlusion. Radiol 2009; 250: 878-886. Perez A, Restrepo L, Kleinman JT, Barker P, Beauchamp N, Wityk RJ. Patients with diffusion-perfusion mismatch onmagnetic resonance imaging 48 hours or more after stroke symptom onset: clinical and imaging features. J Neuroimaging 2006; 16: 329-333. Baron JC, Moseley ME. For how long is brain tissue salvageable? Imaging-based evidence. J Stroke Cerebrovasc Dis 2000; 9: 15-20. González RG, Hakimelahi R, Schaefer PW, Roccatagliata L, Sorensen AG, Singhal AB. Stability of large diffusion/perfusion mismatch in anterior circulation strokes for 4 or more hours. BMC Neurol 2010; 10: 13. Harris AD, Kosior RK, Chen HS, Andersen LB, Frayne R. Evolution of hyperacute stroke over 6 hours using serial MR perfusion and diffusion maps. J Magn Reson Imaging 2009; 29: 1262-1270.